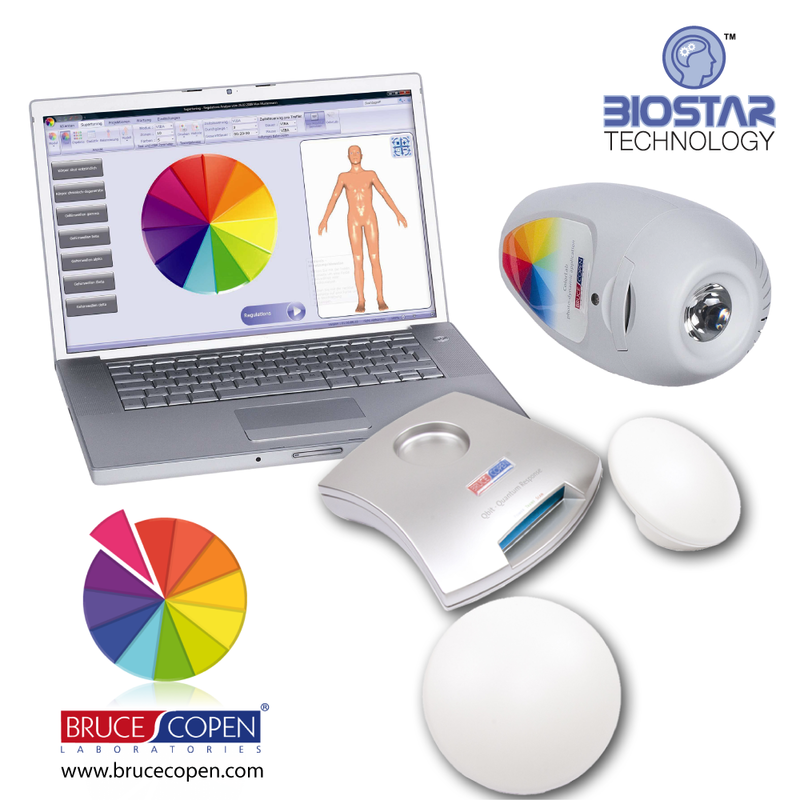 ​The 2-in-1 system of Bruce Copen combines analysis and therapy in one product - and for all levels of being. The aim is the totality healing of body, mind and soul . ​The clearly structured user interface of the software makes state-of-the-art medical technology for audiovisual children's play. The most complex procedures are also easily understandable for patients and can be tracked directly on the screen. ​After you have determined the analysis information of your patient via the hand applicators, the SuperTuning system automatically checks the optimal balancing parameters. This allows you to go straight to the basic treatment: You begin the patient's balancing with the hand applicators. ​The completely redesigned high-power LED system provides your patients with the necessary bio triggers in the form of a precisely coordinated color light. The irradiation is computer controlled and can be seen as a biophysical supplement for optimal balancing. ​The fourth component, which naturally supports your patient in his stabilization process: individualized SuperTuning essences, which you yourself shape on the basis of the proven RechtsRegulats®. ​The system automatically determines the ideal duration for sound balancing with acoustic beat signals. You do not have to worry about selecting the sound module: Each SuperTuning color light is automatically assigned the corresponding frequency in eight octaves. In a first step, the patient is initially "read" two hand-held applicators : The organism is on physical, mental and spiritual level tested. At the same time, the system determines precisely the Super Tuning Remedy that for each patient individually and to accompany therapy is recommended. Now you can share with your patients the concrete analysis devote: energetic, psychosomatic and regulative. How does Copen SuperTuning work in patient analysis? Quite simply, it examined the body on its demand for effective Bio trigger . The underlying frequencies are visibly displayed on the monitor via color scales. Unconscious disease pattern of the patient to be tracked, localized disharmony . 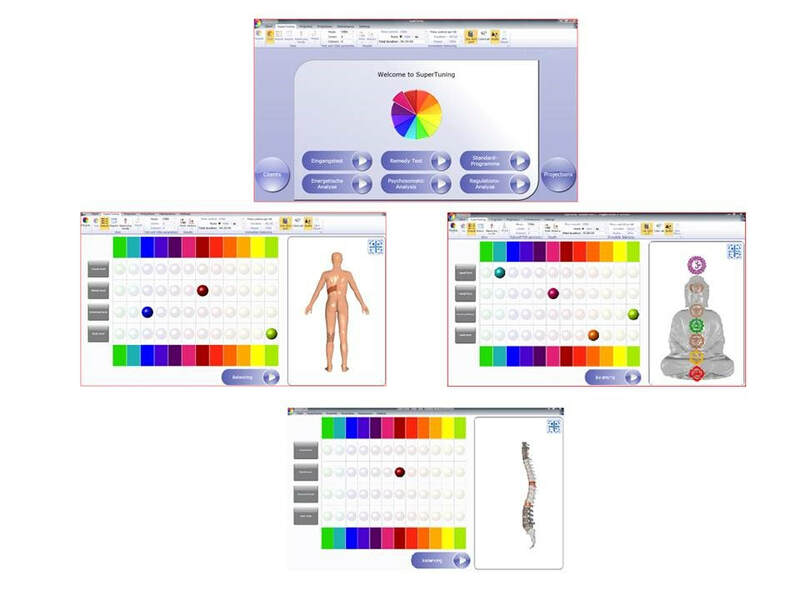 Using color markers, the system shows in detail which body and brain areas need harmonization. Now you can with the targeted balancing start the patient and using the Copen Super tuning which regulate Bio-trigger system . This way, you can optimize the health of your patient exactly where the body actually needs support. This happens in three physical levels simultaneously: - by Skalarwellenmuster directly on the body - so the control fields are compensated - as "hochoktaviertes" acoustic Hemi-Sync signal through headphones to achieve synchronization of the brain hemispheres - as precisely calibrated high-power light irradiation on the skin of the patient in order to unblock the body zones to supply power or to carry a systemic therapy. Simplify Medicine - we have been guided by this principle when we developed the SuperTuning system. The system works on the basis of 12 planetary frequencies , as fundamental Biotrigger were analyzed. The frequencies are applied acoustically (via planetary sound according to the Hemisync ® method), visually (coordinated colors via computer-controlled HighPower LED color lamp) and Tesla coils. Copenhagen Super Tuning is extremely easy to delegate to use and easily, eg for the use in wellness centers . The therapy with SuperTuning is ideal for all stress-related illnesses, burn-out, sleep disorders or similar illnesses. Besides, the system is very successful as adjunctive therapy at about acupuncture treatments used: The relaxing effect is immediately noticeable to the patient. Also known as "therapy before treatment" to Super Tuning is ideal: Ahead manual therapies muscles is achieved and the patient thus optimally prepared.